The term H-Vision is being used for the type of hearing used in Outdoor Eyes since hearing is directly related to seeing. When a sound is heard, there is usually an object related to that sound that can be seen such as a crashing wave on a beach, an airplane flying overhead, a bird singing, a deer running through the woods and even a robin chasing away a crow from a nest. You can not see wind but you can see the objects that the wind moves such as leaves on the ground, branches swaying and a sailboat sailing through the water. All sounds indicate a potential OTG Photography opportunity. Sounds exist at all times. There is almost never a moment that sounds are not heard. Sometimes, due to the lifestyle of modern world people, they tune out any sounds that they can. They refer to the sounds that they hear as NOISE since the constant sounds of honking horns while driving, people talking on their phones all around or the crying of young infants always seem to indicates NOISE. But, unfortunately, they also tune out any important sounds along with the irritating noise. So, when you drive down the road with your car window open, listen to all the sounds outside... even to the annoying horns. You might even see a hawk flying above just by hearing the call of the hawk. Or, when you enter the woods and you hear a few young children talking loudly in the distance, don't tune them out. You won't be able to hear the important birds and you will possibly miss an OTG Photography opportunity. 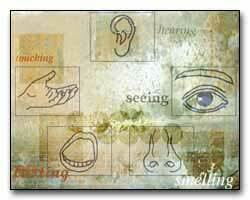 There is a distinct relationship to what is heard and what is seen. Whenever an OTG wildlife photography opportunity exists, listen to the sounds around and record those sounds into your memory. Be aware of the loud, the soft, the distant and the close sounds. Sometimes, there are early warning sounds present before the OTG wildlife photography opportunity. By understanding the relationships between the sounds and what wildlife is present, you will be prepared in advance for the possibility of taking exceptional wildlife photographs. If you happen to see a beaver, did you also hear the slapping of the tail on the water? If you happen to hear a sound similar to a pebble dropping in the water, did you see the concentric rings of the water where the noise came from? Did you happen to hear a frog croaking just before the noise in the pond? Could you have taken an OTG Photograph before the frog disappeared if you had identified the early warning sounds? These are the types of clues that you can be aware of when an opportunity arises. When you understand the sounds, you will be ready to take advantage of the situation. Understand the languages of the birds (refer to the Bird Language section) will indicate what OTG Photography opportunities exist. Study that section carefully and practice in your own backyard. It is impossible to teach the relationships of every sound and what it could possibly relate to. Sometimes the exact same sound indicates a completely different opportunity based on the topography of the land and the forestry that surrounds you. That is up to you to observe and document in your mind for future reference. All your knowledge will be learned as you begin to observe and photograph nature. You have certainly already been in many situations that you could have learned from, but you might have not been able to understand all the relationships that existed. Can you recall some great wildlife photography moments in the past that you are able to remember what you heard at that time? Those are the kinds of relationships that are important for OTG Photography. Many times the direction of the sounds are very confusing to you. Since birds have a sort of ventriloquist voice, their sounds seem to come from multiple directions at the same time. But you know that this isn't so. By cupping your two ears, you will be able to pinpoint the direction of the sound. Place your hands behind your ears and cup your hand around your ears. Gently press your ears forward in the direction of the sound with your index finger and your thumb. When the sound is heard the loudest and when the sound seems to resinate in the center of your heard (similar to stereo), that is the direction of the sound. You might even feel that the sound is even closer to you at that moment. Practice this exercise with the birds in your backyard and you will improve your skills. 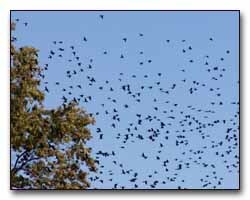 Walking through a park near my house one day, I started to hear the sounds of a group of crows in the far distance. I knew from past experience that there was a chance that an OTG Photography opportunity might arise. I kept listening and the sounds of the crows came closer and closer. I knew that the sounds of the crows might indicate that they were chasing after a Red-Tailed Hawk. I listened closely and the sounds indicated that the crows were quite low and that the crows were in hot pursuit. I focused my camera above and set the camera to the proper settings. Fifteen seconds later, the Red-Tailed Hawk flew about twenty feet directly over my head with about ten crows not far behind. Unfortunately, my photographs were not the quality that I desired. But, at least I had the opportunity to photograph the Red-Tailed Hawk being chased by the crows. That is what H-Vision brings to you... OTG Photography opportunities.